“Signage” means the implementation of a multimedia point of information programmed to offer interesting information to users who are in a large area (a mall, airport, railway, etc.). To meet this goal, we have developed a customizable information system, accessible from computerized points (multimedia kiosks), strategically placed throughout the building with a good design and and the possibility of adding extra devices (camera, microphone, speakers, etc.). Getting lost in large areas is over, we will guide you! 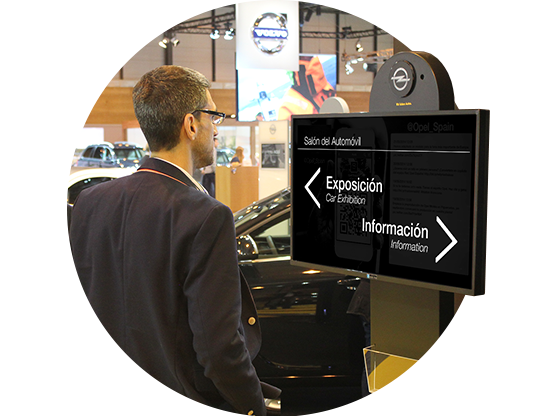 Our signage module is configured to give an intuitive, simple and fast use to users, so the information is highly distinctive and is obtained directly. The user comes to information through simple menus made up by shortcuts, facilitating the access to information via buttons that guide the user. Simply touch the screen and see an attractive transition to the language selection (if it’s necessary) and you will begin to communicate with the virtual assistant.